“Meditate well on this: Seek God above all things. It is right for you to seek God before and above everything else, because the majesty of God wishes you to receive what you ask for. This will also make you more ready to serve God and will enable you to love him more perfectly” (St. Paschal). 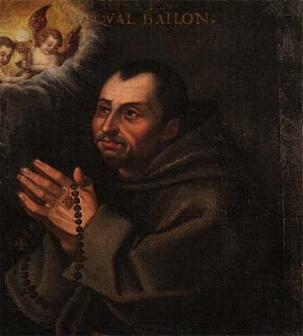 The 17th of May is the feast day of St. Paschal Baylon. Some have said he is not a “real” saint because his feast day is not in the Roman Missal. It is a valid point that helps us realize that many canonized saints feast days are not in the Missal (the reasons being the very number of saints, their relative importance (local or universally known) and also their time of canonization. Numerous saint, recently canonized, are not included simply because of timing of revisions of this book). These practical matters also contain an important lesson, a lesson especially taught through the life of St. Paschal Baylon. Hidden saints: The graces of these hidden saints are many. St. Baylon lived a profoundly humble and blessed life. He was a lay Franciscan in Spain. He had limited education and served mostly in his monastery as porter, cook, gardner or beggar. He was most known for his deep love for Christ in the Blessed Sacrament and spent as much time as possible in prayer before God. This passionate love for Jesus opened doors of humble love and wisdom that many came to seek from God’s humble servant. His simple faith, growing from his rustic poverty as a shepherd, enabled him to know and share powerful blessings not embellished or entrapped in politics, wealth or pride. The apostle Saint Paul reminds us that all the baptized, seeking to follow our Lord are, in Biblical fact….saints. That we may not yet fully realize this truth in no way negates it. That we may stumble in our journey of faith would often indicate we follow a path well trod as we seek the Crucified and His way of Crucified Love. As we better know those who have gone on before us, such as St. Paschal Baylon, as we listen to their lives and words we are reminded of our need to live well a life of prayer, “to seek God above all things..to serve and love him more perfectly” and to know He who longs to hear and answer our prayers. You are being sent into Hell forever … outside of the God’s Catholic Church. The Catholic Faith *is not* Bible interpretation … it is the Catholic infallible Sources of Dogma (which has been ruthlessly hidden from you, and which you must know). The Catholic Church didn’t even define the Bible’s New Testament Canon until 397 A.D. at the Council of Carthage. Section 12 > Anti-Christ vatican-2 heresies (50 listed) … followed by many Catholic corrections. Section 13.2 > Catholic Dogma on automatic excommunication for heresy or participating in a heretic cult such as … vatican-2, lutheran, methodist, evangelical, etc. Section 13.3 > Matt 16:18, Gates of Hell scripture … is *not* about the Office of the Papacy … four Dogmatic Councils defined it as … heresy not causing the Dogma to disappear. Section 13.6 > You’re not a Catholic priest and never were … because of the Catholic Jurisdiction Dogma. I was going to delete your comment as it is so out of context and frankly, hate-filled but I decided to let it stay. It is a very sad testimony of beliefs that seem to be far beyond the Gospel of our Lord Jesus Christ. The fact that you post anonymously, using very confused references speaks to your fear and confusion. May the peace and blessing of Christ be with you and lead you beyond your torment. And, if you had read my post and blog you would have understood there was no need to tell me “I am not a priest”. I am simply a servant of Christ and His Church serving as a Permanent Deacon.